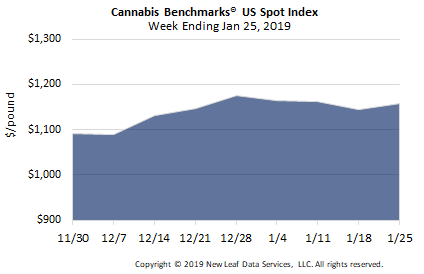 U.S. Cannabis Spot Index up 1.1% at $1,157 per pound. The simple average (non-volume weighted) price increased by $30 to $1,253 per pound, with 68% of transactions (one standard deviation) in the $464 to $2,043 per pound range. The average reported deal size declined to 3.4 pounds this week from 3.5 pounds last week. In grams, the Spot price was $2.55, and the simple average price was $2.76. The relative frequency of trades for indoor flower grew this week, by 1%, while that for greenhouse product decreased by the same proportion. 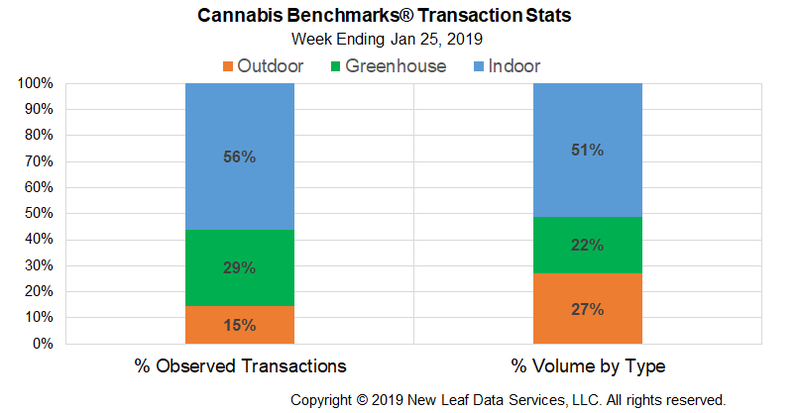 The relative frequency of transactions for outdoor flower was unchanged compared to last week. 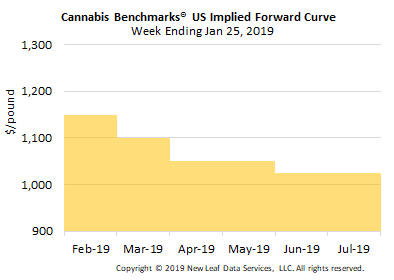 The relative volumes of warehouse and greenhouse flower both contracted week-over-week, by less than 1% each. 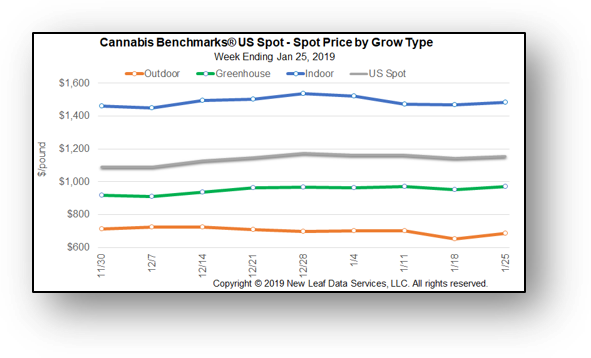 Meanwhile, outdoor product’s share of the total documented weight moved nationally grew by about 1% compared to the week prior. The U.S. Spot Index ticked upward this week, by 1.1%, to settle at $1,157 per pound, which was also the monthly average price for January. This month marks the second consecutive one in which the national monthly mean has risen, after slipping to its annual low for 2018 in November. Still, January 2019’s monthly rate is down by almost 14% compared to a year ago, when the U.S. Spot averaged $1,343 per pound in the same month in 2018. California and Alaska were the only two state markets covered by our reporting to see declines in their Spot Indices this week, while that of Nevada was flat compared to last week. The national volume-weighted price for flower to be sold in adult-use markets rose this week. Rising rates in Colorado, Oregon, Washington, and Massachusetts outweighed decreases in that sector of the market in California, as well as in Alaska. Decreasing wholesale rates in the medical section of California’s market were almost wholly responsible for the dip in the national price for product designated for registered patients recorded this week. February 2019 Forward closing assessment up $30 to $1,150 per pound. The average reported forward deal size decreased nominally to 55.2 pounds. The proportion of forward deals for outdoor, greenhouse, and indoor-grown flower was 56%, 28%, and 16% of forward arrangements, respectively. The average forward deal size for monthly delivery for outdoor, greenhouse, and indoor-grown flower was 62 pounds, 49 pounds, and 43 pounds, respectively. At $1,150 per pound, the February 2019 Forward represents a discount of 0.6% relative to the current U.S. Spot Price of $1,157 per pound. The premium or discount for each Forward price, relative to the U.S. Spot Index, is illustrated in the table below. Are you a licensed market participant in the U.S. or Canada? Do you support wholesale market transparency? Become a member of our Price Contributor Network and receive discounted pricing and exclusive analysis! 1-888-502-7298 toll free within the U.S.
1-888-501-7613 toll free fax within the U.S.